I’m still working on the Seasonal Bliss patterns but decided to “take a break” from them. Sometimes leaving the pattern alone for a couple of days gives you a fresh perspective when you pick it back up. 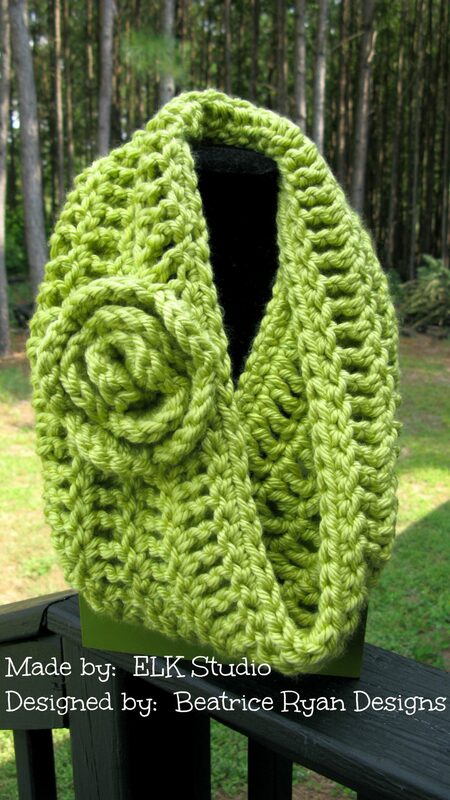 Anyway, remember the free cowl pattern I posted yesterday by Beatrice Ryan Designs? The pattern is free for only a limited time, so I decided to start the project. I love how it turned out! I normally don’t work with chunky yarn or a big hook, but I wanted a challenge. After the first round, I began to fly through the rest and it was smooth sailing till the end! I’m not an expert flower maker, so I need to read the directions carefully but was able to follow Elena’s directions really well. If you are looking for a really quick project, then here you go! Here’s my picture of Elena’s great design! I hope you like it! Have a great day and be blessed! Absolutely lovely,,, Thanks for sharing your version of my latest free pattern!!! It’s a great pattern and glad I made it while it was FREE!